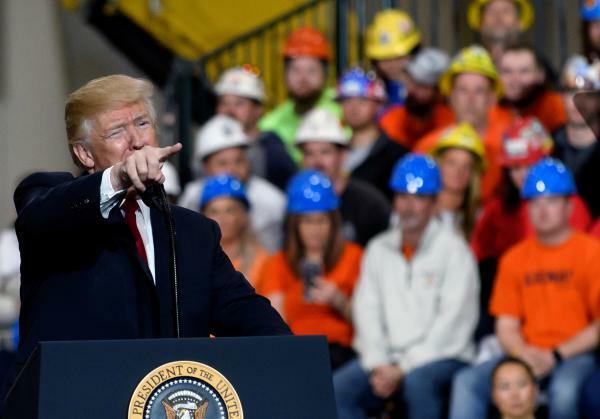 President Trump boasted about economic gains under his presidency on Thursday, during a rally at a facility of the Operating Engineers Apprentice and Training, in Richfield, Ohio. Despite a wave of controversies, President Trump's popularity seems to be rising ever so slightly, according to a couple of recent polls. The bump may be linked to the fact that more Americans seem to be crediting Trump for the nation's healthy economy. And that has raised one of the central questions of the midterm election season: whether the economy will help keep Republicans in control. "I held my nose at the voting booth," Cowan said. But, these days he's satisfied with at least one aspect of the Trump era. "Financially speaking, I cannot complain," he said. "My retirement I have through my employer has shown a remarkable increase." Still, neither Cowan's personal finances nor the economic health of the country have changed his overall opinion of the president. "I can look at President Trump and be like 'OK, his policies in regards to the economy and stuff are good for the nation.' But I'm still going to think President Trump — the whole kit and caboodle — is a bitter pill to swallow," he said. Trump's average approval rating is around 41 percent, which is not as high as you would expect, given the country's low unemployment numbers, soaring stock market and expanding economy. Granted, research by Mary Stegmaier, a professor at the University of Missouri, has shown there's generally a lag in how the public perceives who's responsible for the economy. "The first year of a presidency is quite different than later years ... because when a president is inaugurated he has inherited the economy from his predecessor," she said. "It takes a while for the public to start holding the new president responsible for the economic conditions." "There's a sense that things are improving, but it's going to take some time for that to evolve into a comfort level," Winston said, pointing to a recent survey his consulting company conducted that showed many Americans still feel like they're living paycheck to paycheck, just a few hundred dollars away from a financial crisis. "People are still assessing — is this a temporary moment in the economy, or is this something longer term that they can have some confidence in that will let them then economically behave differently," Winston explained. Still, if Republicans are going to focus on one issue they think could give them a boost this campaign season, it's the economy (and taxes). Winston says it's imperative for Republican elected officials to sell the tax plan. "If you just take a look at the exit polls, the economy tends to pretty consistently be the top issue," Winston said. "Unemployment claims are at their lowest level in 45 years," he said, repeating that last line to applause. "Lowest level — 45 years!" "We can't lose that by getting hurt in the midterms, so we can't be complacent," he told the crowd gathered at a local union apprenticeship and training center. "There's never been an economy like this; everyone says it's the most important thing." He said the best predictor in midterms is the "generic ballot" — a poll question that asks voters which party they'll vote for in Congress (rather than a specific candidate question). In Abramowitz's research, the other key factor is the president's approval rating. "The approval rating itself is a much better predictor of what's going to happen in midterm elections than any measure of economic trends," he said. The economy, of course, can factor into a president's approval numbers, and Abramowitz says his research shows that when we have an economy in a recession, it almost certainly will bring a president's approval rating down, but "when you have a sort of mediocre to good economy, it doesn't necessarily mean the president is going to be popular." And in situations when the economy and a president's approval rating are not in sync — as is the case these days in the Trump presidency — Abramowitz says the approval rating tends to be far more important. "We saw something very similar back in the 1960s," he said. "In 1966, we had a midterm election, Lyndon Johnson was in the White House. The war in Vietnam was escalating and his approval rating had dropped, but the economy was very strong." So, Abramowitz's message is that an economy that's chugging along may not be enough for voters to credit the party in power, which means Republicans need to figure out a way to tie the economy to how voters feel about the president before November ... so long as the economy stays in good shape.